PCAAE, with the support of Honorary Members Susan Sarfati and Liz Jackson, joined the Association Day meetings, networking and roundtable discussions at the IMEX Worldwide Exhibition for the MICE industry (meetings, incentives, conferences and events) held from May 19-22, 2014 at the Messe Frankfurt, Germany. IMEX Frankfurt is a major yearly networking event bringing associations together to share best practices, introduce innovative ideas and provide encouragement and inspiration towards the attainment of their respective goals. More than 70 highly informative educational sessions and seminars were held during the event. It is also a venue for more than 3,500 professional exhibitors, coming from over 157 countries to showcase their products and services such as air travel options, conference venue facilities, destination management facilities, and training and educational services that cater to various requirements of associations. The event was attended by over 8,900 visitors, including over 3,800 qualified hosted buyers. Over 300 association executives from 40 countries in Europe, North America, South America and Asia attended Association Day event held a day prior to the IMEX show. Association Day was full of tailored content aimed at helping association executives progress in their careers and advance their associations. This year’s IMEX Association Day three-track programme (operations, meetings and executive) covered issues that are challenging many parts of the meetings industry in different ways. The programme also offered insight from ICCA on why “big data’ is a big issue” and how digital platforms are transforming expectations about learning, professional development and community or customer engagement. Also involved in shaping the day’s programme were ASAE: The Center for Association Leadership and PCMA. Both offered association delegates sessions focusing on ‘Member Engagement Models’ and the ‘Evolution of the Annual Meeting’. Five (5) one-hour interactive, expert-led sessions rounded off the day. Each focused on a current industry challenge and encouraged moderated small group discussion on: “Sustainable growth and innovation”; “Generating new revenues through diversification”; “Activating and engaging audiences and stakeholders in a digital world”; “Technology trends for valuable delegate experience and RFPs, tenders and bids – successful negotiations”. President Emy Chavez represented PCAAE in the IMEX event, joined the Association Day discussions on the Executive Tracks ESAE Session: “Designing for Strategic Impact – Association Events that Matter” ; and ASAE Session: “Member-Engagement Models: A Glimpse into the Future”. She also participated in the hot topic discussions, a one hour interactive session on “Generating New Revenues through Diversification” and several other campfire discussions most of which are ways and means to improve the Association and its members. 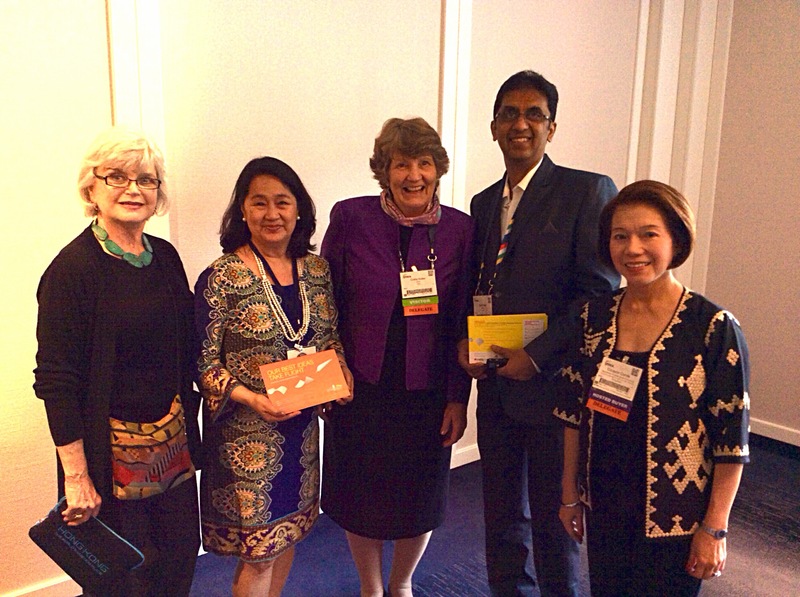 It was also an opportunity to personally thank ASAE Global Development Officer Greta Kotler for her support of PCAAE.